Mar 1, 2014; Hartford, CT, USA; Cincinnati Bearcats guard Sean Kilpatrick (23) shoots against Connecticut Huskies center Amida Brimah (35) in the second half at XL Center. HARTFORD, Conn. (AP) — Shabazz Napier scored 18 points and grabbed 11 rebounds to lead UConn to a 51-45 upset of No. 11 Cincinnati on Saturday. The Huskies (23-6, 11-5 American Athletic Conference) won despite going without a field goal for the game’s final 7 minutes. But they held Cincinnati (24-5, 13-3) to just 13 baskets on 48 shots, while scoring 15 baskets on the same number of attempts. UConn led by one at halftime. But the Bearcats had just one field goal in the first 7 minutes after intermission, and Connecticut went on a 13-4 run over the first 11 minutes to open up a 39-29 lead. Connecticut’s final field goal came with 7:39 left in the game, a Ryan Boatright dunk that made it 41-32. Cincinnati chipped away, cutting the lead to 45-42 on a pair of free throws by Shaquille Thomas, and the Bearcats had the ball trailing 47-43 with 36 seconds left. But Phil Nolan stepped in front of a Kilpatrick drive to the basket, drawing a charging foul. The Bearcats were forced to foul again, and Napier sealed the win with a pair of free throws. It was the senior’s 25th double-digit game during a season in which he has put up a career-best 516 points. He hit just 4 of 13 shots, but was 9 of 10 from the foul line. Lasan Kromah finished with nine points for UConn while guarding Kilpatrick, and holding the Cincinnati star to 4 of 16 shooting. The Huskies scored 20 points off 20 Cincinnati turnovers. It was a game of big runs in the first half. UConn scored seven in a row and held Cincinnati without a point for more than seven minutes. But the Huskies hit just two of their first 15 shots. 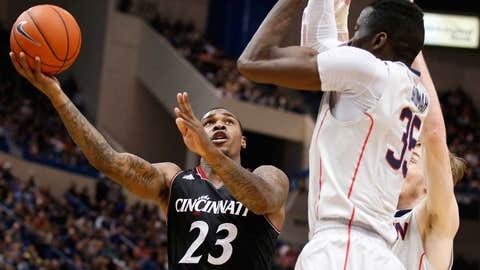 The Bearcats trailed just 9-7 after Kilpatrick followed up on his missed layup. That started a 10-0 run that put Cincinnati up 15-9. The Huskies countered with a 9-0 run before things settled down. Kilpatrick had 12 of his points in the first half. His second 3-pointer of the game gave Cincinnati a 25-20 lead. It was the 300th 3-pointer of his career. UConn scored the final six points before intermission, with Napier cutting through the Cincinnati defense to give the Huskies a 26-25 advantage at halftime. It was UConn’s first win against any of the teams ahead of it in the conference. The Bearcats, who had not played since their one-point loss to Louisville last Saturday, could have sealed at least a share of the conference title by winning this one and their final two. UConn has won six of seven since falling to Cincinnati 63-58 in Ohio on Feb. 7. The 11th-ranked Bearcats came into the game tied for first place with Louisville.